Istanbul is a great city. It straddles the Bosphorus placing half the city in Europe and half in Asia. It’s an interesting mix of cosmopolitan and traditional is full of rich history and impressive structures left behind by the Greek, Roman and Ottoman empires. Istanbul is one place where it’s worth the price of admission to see the tourist sights. You could easily spend a full week just visiting sights in Sultanahmet – an old town area home to the Blue Mosque, the Hagia Sofia, Topkapi Palace, the Basilica Cistern and the Grand Bazaar. For me, a visit to the Hagia Sofia reflects the religious, cultural and architectural significance of the city. What began as an Orthodox basilica turned mosque turned museum helps to tell the story of Istanbul’s past. The Hagia Sofia is well known for it’s Byzantine architecture which held influence in the Eastern Orthodox, Roman Catholic and Muslim worlds. It served as the Orthodox patriarch of Constantinople and was ransacked during the fourth crusade with relics sent off to the West. During Latin occupation the church was turned into a Roman Catholic Cathedral, but once the Ottoman Turks captured Constantinople, the fun times for Christians were over. 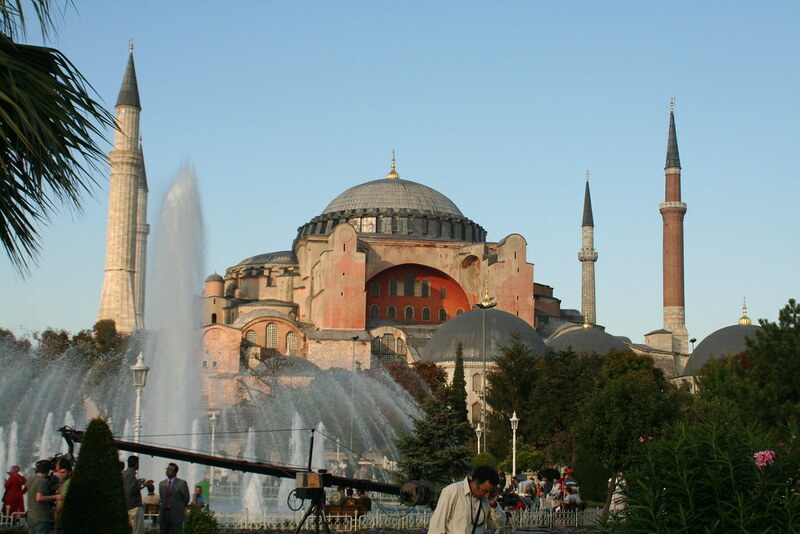 The Hagia Sofia was immediately converted to a mosque. At independence, the father of the nation Ataturk (fun if pronounced like attaboy) turned it into a museum. Despite the massive scaffolding inside, it’s a beautiful place to visit and it’s facade against the blue sky is one of the most stunning in Istanbul. To be fair to yourself and Istanbul, you really need to escape the tourist masses in Sultanahmet and check out the culture, food and sights that abound elsewhere. We made time to cruise up the Bosphorus for a glimpse of the Black Sea, stroll across the Galata Bridge watching the fishermen try to make a catch, and take in the well preserved Byzantine mosaics at Chora Church. One activity I am not sure I can recommend is walking the city walls. It sounded like a great adventure and was even detailed in the guidebook we borrowed from our hostel, but it turned out to be a little unpleasant and unrewarding climbing over crumbling stone and broken beer bottles. Not the best restored sight in the city. One of the most interesting aspects of our visit was that it was the start of Ramadan. Since Istanbul is far more secular than many cities in the Middle East, finding food during the day is not difficult – especially in the touristy areas. But when you venture away from tourists and into neighborhoods, you have to be more discreet and respectful when quenching your thirst. The festival like atmosphere in the Hippodrome outside of the Blue Mosque after sunset is a great time, but the preparations for Iftar (breaking fast) are not to be missed for people watching. Outdoor cafes start to fill up an hour before sunset, a set menu is placed on all the tables, and whole families stare longingly at their bread basket until the speaker blasts from the Blue Mosque. Let the eating begin!